Boston, Mass – Most people don’t know that Boston has its own island paradise, just a 30-minute boat ride from Long Wharf. The Boston Harbor is sprinkled with 34 islands, eight of which make up the Boston Harbor Islands “national park area” (whatever that is). Offering a range of ecosystems and a few historic attractions, these islands are ideal for trail walking, bird-watching, fishing and swimming. Does that sound like a perfect adventure for the twins? 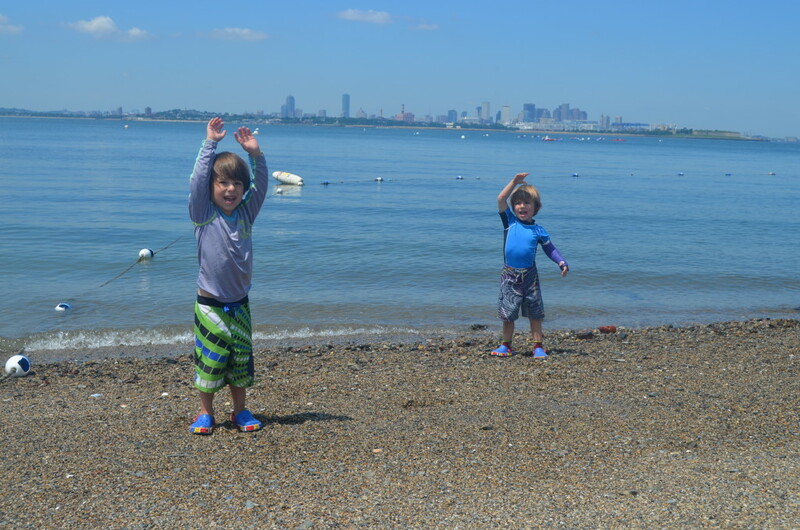 We intended to go straight to Spectacle Island, which is close to Downtown Boston and has the most extensive facilities–including a beach. Of course, when we arrived at Long Wharf at 10am, we had just missed the ferry and the next boat was already booked, which meant we had a one-hour wait in front of us. So we changed our plan and hightailed it to Georges Island, site of Fort Warren a 19th-century fort and Civil War prison. There’s not a lot going on at Fort Warren, but that’s part of the appeal. The rooms are mostly bare and dark; the walls are still crumbling; the stairs are precariously narrow; and the whole place retains the air of an abandoned fort. There’s no introductory video. There’s no audio tour. There is a map, and a few warnings about the unsafe areas; but for the most part, visitors are free to wander and explore, investigating the dark, mysterious corners of this vast place. It may not be for everybody, but it’s a little more adventurous than your typical scrubbed-down, fenced-off historic site. We even brought flashlights. Twin S thought it was a blast; Twin V was slightly freaked out. Fortunately, there were also cannons, which seemed to make everything better. 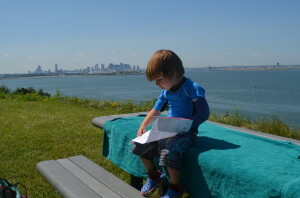 We explored the fort for an hour (not the whole fort, Twin S was quick to point out) before catching the next ferry to Spectacle Island. The main attractions at Spectacle are the swimming beach and the five miles of walking trails. The beach was a bit of a disappointment. The shoreline is rocky and the water is frigid. The twins were disappointed that there were no waves. Still, it’s cool to swim with the Boston city skyline as your backdrop. It did not take long, however, for one twin (we’ll call him Cranky) to melt down for some non-reason. In Cranky’s defense, we were past due for lunch. And I admit that I might have had a short fuse myself, considering that when Cranky started to whine “I want to go home” I immediately said “Okay, let’s go,” packed up the bags and headed toward the boat dock. Of course this provoked his brother, and then I had two wailing twins. Fortunately, the boat wasn’t there, which gave us a chance to come to our senses. We all decided that we wanted to stay and have fun. But first we should go eat lunch. After our visit to the snack shack, we took a quick look around the visitors center, where a map of the island caught the eye of Twin S. He’s crazy about maps–a regular Dora the Explorer. He set his sights on the “mountain peak” at the island’s center, which is the high point of all the harbor islands. And we were off. That was a long walk for four-year-old feet. I don’t know how long it was–probably about a mile in each direction. But the first half was uphill, and it was hot. Twin V requested frequent stops, during which he usually retreated under a picnic table. But Twin S insisted that we press on. When we finally reached the top, we were rewarded with expansive, 360-degrees views of sea, sky and city. The boys were giddy. We celebrated with lollipops. On the way back down, we could see the ferry approaching long before we were anywhere near the dock. Then we heard the announcement about its next departure. The boys were exhausted and they wanted to go home. We decided to run to catch the boat–and we made it with zero minutes to spare. Both boys were asleep within five minutes. I wasn’t sure what the take-away from this day would be. 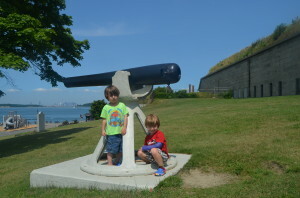 I mean, the fort was scary, the beach was a bust, the hike was exhausting and we had an all-family meltdown somewhere in the middle of all that. Was this a fun day? Apparently, it was. 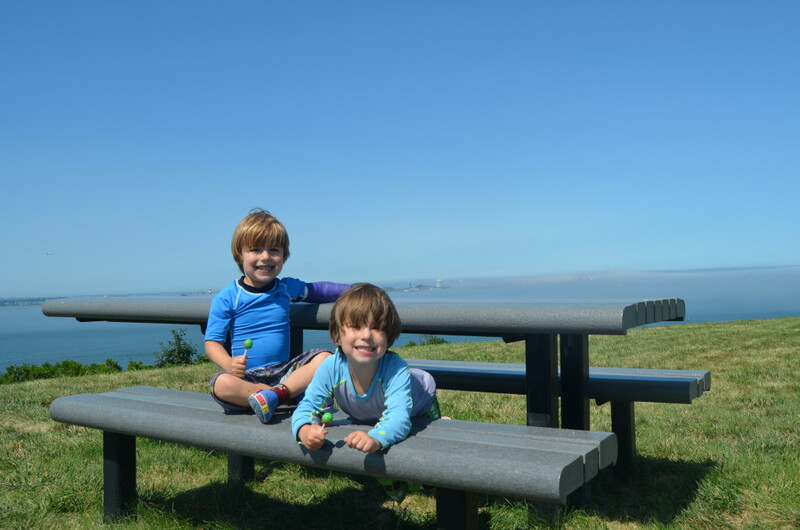 The twins could not stop talking about our adventure–riding the ferries, exploring the fort and following the map to the tippety-top of the island mountain. Even the exciting finish–running to catch the ferry and jumping on board just as the boat was pulling away from the dock–seemed to be a highlight. So… if the twins had a fun day, then I had a fun day. Island hopping, Boston style.